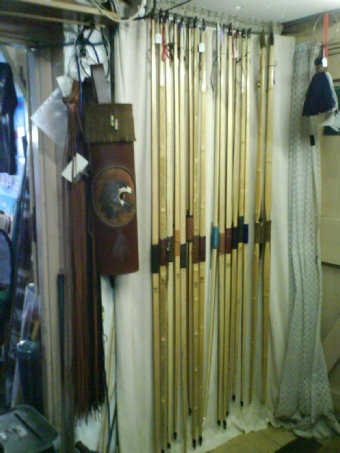 As a specialist in Longbows and the tuition of Longbows, Most of the bows I sell are…….Longbows!!! I have two bowyers who make bows for me, Hilary Greenland (Hickory Greenheart!) And Paul Reed. They are both excellent bowyers and have been making bows for at least 25 years. Hilary also makes bamboo backed American Longbows (flat bows) which are really nice to shoot, and unusual ‘primitive’ and native bows. My Husband, Mick, is now making primitive bows for kids, as it keeps him busy and stops him worrying about his health to much. He loves playing in the workshop. And, now and then, I have a Chris Boyton bow comes in. 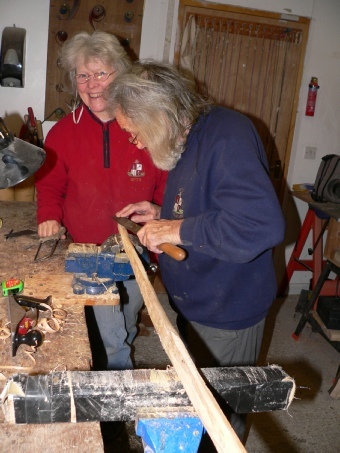 My husband, Mick, making a ‘primitive’ yew bow with Hilary Greenland. Hilary runs bow making classes for SPTA (Sparta), the Society for the Promotion of Traditional Archery. The courses are over three days, and are £250. Well worth it, as you learn to use hand tools as well as making your own single stave bow. 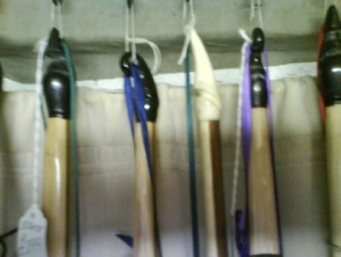 Some of the English and American Longbows I stock, as well as one of my carved quivers. Different nocks from different bowyers. Because they are a reasonable price, it doesn’t cost the earth to get the whole family shooting. A longbow should NEVER, EVER be leant to anyone else! A longbow must ONLY be shot with Mediterranean or Flemish loose. (One finger above and two below the arrow or one finger above and one below the arrow) Note: most societies only allow Mediterranean one above and two below. My Longbows are £530 to £550 at the moment, although that can change at any time, especially if a special is ordered. If I haven’t got one in stock, I can usually have one made within a couple of months, maybe less. If a bow is ordered for you, unless its a ‘one off’, if it doesn’t suit..you don’t get it, it goes into stock and we try again! Longbows by: Hilary Greenland and Paul Reed. American Longbows (Flatbows) and Primitives by Hilary Greenland. NEVER lend your bow to another person! 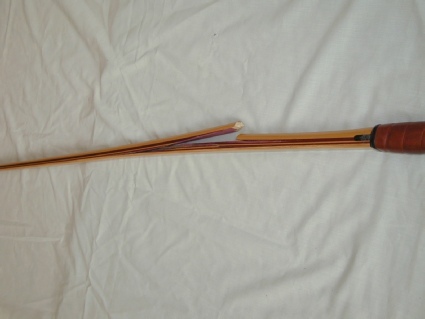 It’s not just a longer draw length that breaks a bow, but the ‘torque’ on the handle being different. LONGBOWS BOUGHT FROM ME MUST ONLY BE SHOT USING MEDITERRANEAN OR FLEMISH LOOSE. 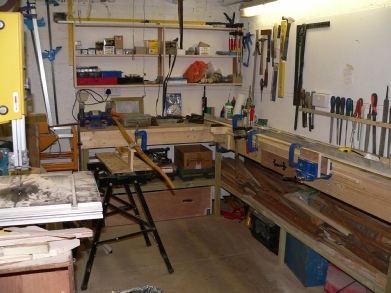 Mick’s now finished bow making room at the end of my workshop.